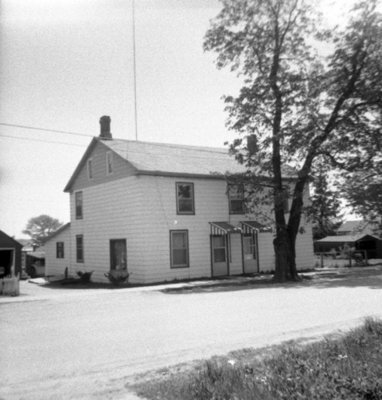 A black and white photograph of 1518 and 1520 Brock Street South. This large frame house was built possibly as early as the 1840s on the west side of Brock Street, south of Victoria Street in Port Whitby (at 1518 Brock Street South). 1518 & 1520 Brock Street South, c. 1969, Brian Winter. Whitby Archives A2013_004_042.